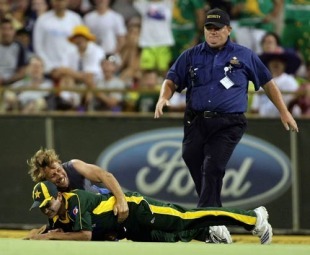 The man who ran on to the WACA and tackled Khalid Latif to the ground on Sunday has been charged with assault and banned for life from the venue. The ABC reported that the 37-year-old man had also been charged with trespass after the incident, in which Latif was grabbed from behind and brought to the ground. The man has been granted bail to appear in court on February 16. Latif was not seriously injured but he was concerned about the lack of security after the man was allowed to run about 50 metres from the boundary without being impeded. "It shouldn't be happening. It just should not be happening," Latif told the Sydney Morning Herald. "It is not that big a deal to me because I am okay. I am not hurt. It was nothing too shocking, but it was still not what you want to have happening in a game of cricket. "I think the fans who go should remember why they go and they should not spoil it for the players and the other people at the ground. People should be at the game to support and enjoy the game. But it doesn't make me angry, nothing like that because I am okay." After the match, the incident drew immediate condemnation from Intikhab Alam, the Pakistan coach, and the Australian captain Ricky Ponting. He said he would have considered leading his side off the field if the same thing had happened to one of the Australian players. "If I was the fielding captain tonight, I would have definitely brought all the players in and had a chat to them about how they felt about it," Ponting said. "That wasn't the first spectator that had been out on the ground tonight either. That's what I would have done if I'd been the captain out there." The incident brought back memories of Terry Alderman tackling a pitch invader to the ground in 1982-83 but unlike Latif, Alderman seriously hurt his shoulder. Intikhab said it was lucky Latif was not badly injured. "He is okay, he has a stiff neck - and unfortunately these things do happen from time to time," Intikhab said. "There is enough security, but it seemed he had had too much to drink. It should not have happened, especially these days, and you have to be very careful. You have to take very strict measures about it for the safety. "The way he tackled him, he could have been very seriously hurt. You have to do something about it, so that it does not happen again. It could be very detrimental. The ground authorities have to make sure that it does not happen." It was one of two unusual occurrences in the second innings of the match. Shahid Afridi, the stand-in captain of Pakistan, was seen on camera appearing to bite the ball and was later suspended for two Twenty20 internationals for ball tampering.